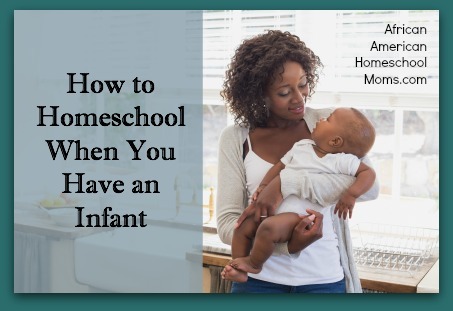 Nurturing an infant is one of a mother’s sweetest joys, but homeschooling with an infant can become one of a mother’s greatest dilemmas. The good news is that it is possible to homeschool with an infant. The not so good news is that it can sometimes be tricky to do so. However, the best news is that like me, many other moms have successfully homeschooled while holding, nursing, rocking, cuddling, and chasing infants. And you, my dear sister, can do it too! Consider implementing these six suggestions if you’d like to homeschool while loving your sweet new baby. My grandfather used to say, “Sometimes you gotta bend so you don’t break.” Perhaps before baby arrived, you had your homeschool routine running like a well oiled machine. Now that your sweet little one is here, you’re going to have to bend. This may mean your children will watch a few more educational videos than you previously allowed. It may mean you school at weird times because the baby’s schedule demands such. This may mean lessons or projects get cut short or even placed on the back burner until a more convenient time. Don’t get worked up about it. Go with the flow and remember this transitional time won’t last forever. One of the most important things to do is recognize that things have now changed. An infant’s sporadic sleeping habits, impromptu feedings, and frequent changes will likely throw off any schedule you previously maintained. But rather than fight against the lifestyle change, embrace this new family dynamic and seek new ways to make it work. You won’t be able to school if you’re physically exhausted and mentally drained, so embrace the new normal. Before my wee one was born, our family had a full, but doable schedule. In addition to schooling we were off participating in a variety of extracurricular activities. But once my third child was born, I had to slow down (way down!) and adopt a new schedule. For us, this meant stepping back from a few activities and only concentrating on the 3R’s (reading, writing, and arithmetic) until I got the hang of mothering three children. My Baby Girl is now three and I’m just now returning to our former schedule. An alternate schedule can help ease your schooling burden. The post partum period is an unpredictable one full of many ups and downs. And if you find yourself battling bouts of post partum depression and episodes of anxiety as I did, you may find the lows to be especially low. Consequently, this dear sister, is NOT the time to grab your superwoman cape and attempt to take flight. This is not the time to try to defy the odds by refusing to skip a beat. Be real by recognizing your limitations and not being afraid to admit you don’t always have it all together. There’s no sense in wearing a happy mask during the day and then sadly crying yourself to sleep at night. When my second child was born, I didn’t want anyone to think I couldn’t handle mothering more than one child, so I was reluctant to ask for help. I refused wise counsel and insisted on doing things on my own. Outwardly, I looked like all was well, but inside I was an insecure and frightened mess. I was governed by pride and it was destroying me. After my third child was born, I didn’t want to repeat costly previous mistakes so I asked for and accepted help. When a fellow homeschool mom offered to take my older children for a few hours each week, I kissed each girl and happily sent them off. When church members offered to provide us with meals, I joyfully set aside my menu planning binder and we enjoyed a meal someone else lovingly prepared. If I felt overwhelmed or unsure of how to balance my newfound role as a mom of three, I immediately spoke up. Friends and family eagerly volunteered to help and I was grateful. Sometimes your homeschool will have to be put on hold. I know some of you just gasped and thought something like this: The kids’ brains will turn to mush! I’ll have to reteach everything all over again. All the time I’ve spent teaching will be wasted. Lean in and let me tell you something. None of that is true. Not one single statement. Just make the baby the lesson. Involve children in the care of their new sibling. Teach them how to hold the baby, how to change the baby, and how to feed the baby. If your children are too young to physically do those things, they’ll learn by watching you. As you come together to read stories or teach while wearing baby in a sling, your children are learning valuable lessons about the importance of family. In addition, you’re thwarting sibling jealousy and enjoying each moment with all of your children instead of wishing infancy away. If you still want traditional paper and pencil schooling, have your older children write daily journal entries about the baby or create a baby brochure full of tips and advice for new big brothers and sisters. Homeschooling with an infant can be tough, but if you apply some of the strategies I’ve mentioned, I think you’ll find it easier to do so. Above all, remember the infancy stage passes by so very quickly. Enjoy every moment with your precious one and be thankful for this new beautiful blessing you have to cuddle and love! If you still have questions, hop on over to the African-American Homeschool Moms Facebook group. There are 1,000+ moms there and many have homeschooled with an infant. We’d love to meet you!